This format doesn't have to 100% exact. For example you can put 'Code Creator' instead of 'Code created by'. Also, you can put something such as 'Code credits' instead of 'Code contributor(s)'. NOTE: Do not put any credits/contribution notes for Porting. Porting is nice and I love to port, but it has no business being in the credits for actually making the code(s). What actions qualify a person as a Code Contributor aka be listed in the Code Credits? This does NOT include somebody modifying a floating value of a code. If you make a totally new code that uses an already found address, the original address founder must be listed as the code contributor. If you nop an already discovered code address to 'make' a new code, you DO NOT get credits as the creator of the code, and you DO NOT get credits as code contributor. Period. Noping an address takes no skill. You can still post the thread of that code with a nop if it doesn't exist, but the original address founder must obviously be listed as the code creator! Same rules apply if you make a code have a 'new effect' by finding an unused floating point value to an already discovered code address. Once again, you DO NOT get credits as the creator of the code and you DO NOT get credits as a code contributor. Any other values you use on an already found address (such as 38000000 or 2C000000, etc etc) is OK for you to put yourself as the Code Creator. HOWEVER, you must remember to add the address founder as the Code Contributor. Important Info Regarding ASM (C2/C0 Assembly Codes) Codes; NOTE: you may not understand some of this if you are not familiar with ASM! These notes are for real Code Creators!! If new instructions are added/removed from an assembly code but the code functions the same, you are NOT qualified to list yourself as the Code Creator. Only as a Code Contributor! If new instructions are added/removed from an assembly code and a new function/feature is added as a result to that existing ASM Code... You are qualified as the Code Creator since it is objectively a new/different code. However you MUST add the original Code Creator as the Code Contributor/Code Credits! Feel free to post a thread of the new code if one doesn't exist already. I personally think credits should be done as they are on geckocodes. Glad you came around to adding credits though. However, as you said before, it will be hard to track down the original creator at times. In my opinion, credits should remain at the bottom. This is comparing apples to oranges but in Movies, the credits are usually after the ending. So to me, it would make more sense for them to be at the bottom. 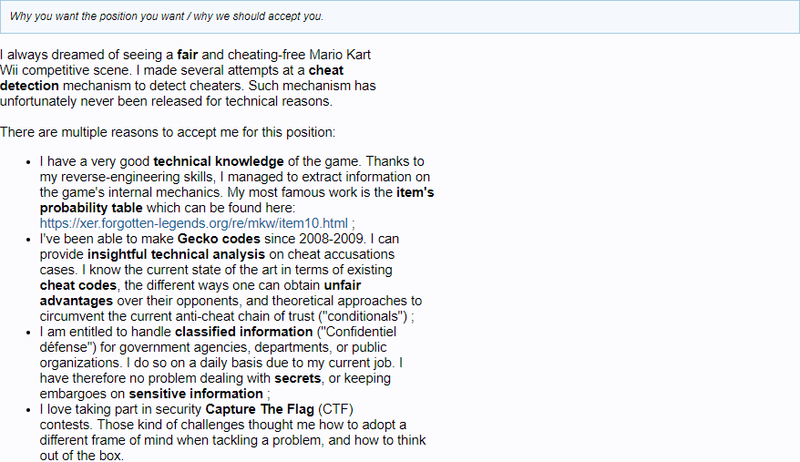 Plus, trying to add Code Contributors with the geckocodes format would be a mess. Code contributors need their cred too. UPDATE: finished added as much code credits as possible to all the codes. there ended being just a few codes to where i coudn't figure out who made them. It appears that my (Gskartwii) Line Colour Changer (https://mkwii.org/showthread.php?tid=432) has been attributed to H3AT, while I created the original set of codes for EUR, JPN and USA. I then searched for the StaticR part that was modified in a PAL RAM dump and created the codes. The code was also later published on Pastebin, misattributed to somebody called "Luis35555vr" or something like that. In retrospect I find it interesting that the PAL code did actually work (it even says I tested it), while the offset in the code is not aligned to a 4-byte boundary. My theory is that Ocarina truncates the last 2 bits of addresses in 04 codes, but that doesn't seem very realistic. In the versions attributed to H3AT, the last 2 bits indeed are truncated. Additionally, H3AT seems to have created more codes for different regions. (06-17-2018, 03:27 PM)gskw Wrote: It appears that my (Gskartwii) Line Colour Changer (https://mkwii.org/showthread.php?tid=432) has been attributed to H3AT, while I created the original set of codes for EUR, JPN and USA. You are certainly correct and I have updated the code credits, apologies for the inconvenience. As for the memory misalignment, I double checked the PAL code in the post and it is correct. I do not think Ocarina truncates the last 2 bits of the address since I have done memory writes that are not aligned to a 4-byte boundary and they work as expected. Perhaps something changed in later versions of Ocarina or Gecko ?